Werner Burkart, Deputy Director General, International Atomic Energy Agency, Vienna, Austria. ITER is only one step on the long road to the reality of commercially-generated fusion electricity. But make no mistake: it is a major step." 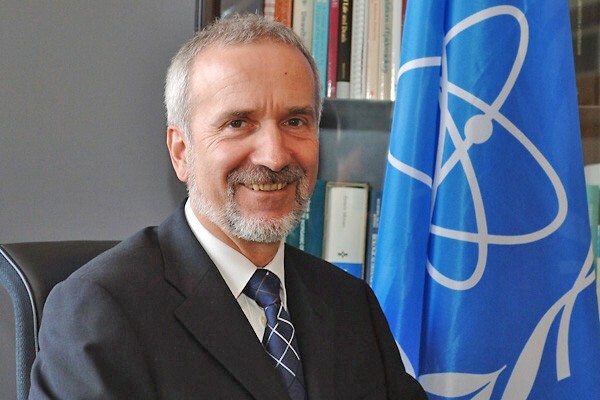 Mr. Werner Burkart has worked as Deputy Director General of the International Atomic Energy Agency (IAEA) and Head of the Department of Nuclear Sciences and Applications since 2000. The IAEA has been the facilitator and supporter since the beginning of the ITER project and it was Dr. Burkart who soundly navigated the ITER negotiations through successive meetings at the IAEA's headquarters in Vienna. The story of ITER already bears several hallmarks of success. The ITER Parties now represent fully half of the world's population. The establishment of the ITER legal entity and the start of construction clearly represent critical milestones. And the vision of ITER itself - harnessing fusion to realize a future of clean, abundant, low-cost energy - is beginning to provide much-needed inspiration for a new generation of scientists. ITER is only one step on the long road to the reality of commercially generated fusion electricity. But make no mistake: it is a major step. It has brought new promise and hope to the field of energy research. In recent years, a number of investments in magnetic fusion and plasma physics have clearly made with the ITER machine as the goal. And those investments are beginning to pay off. From the outset, the International Atomic Energy Agency has been closely involved with the ITER project. The Agency has served as both a moderator and a facilitator of project negotiations. Fusion research has been encouraged - uninterrupted even during the periods of uncertainty that have at times slowed ITER's progress. But as ITER moves forward into a new phase, it is incumbent on the Agency to recast itself in a new role. How can the Agency best help in the future? A first, essential support function - and one that is traditionally the role of the Agency - is to promote effective information exchange. The power of fusion is of interest to the many participants in relevant Agency-sponsored Coordinated Research Projects. As fusion research progresses, more intensive efforts in plasma physics will be required. Additional satellite tokamaks will be needed to consider and advance alternative options in magnetic confinement. Effective information exchange will be critical to these efforts. By expanding awareness of the project and promoting broader interest in fusion and ITER, Agency outreach efforts can attract new pools of expertise - and over the longer term, can encourage human resource development for fusion research which will also rejuvenate nuclear sciences as a whole. The Agency can also assist by ensuring that a network of agreements is set up to cover the exchange of results from this work. A second, related function - in my view - is to promote increased collaboration between fusion and fission research efforts on important issues of common interest. Certain aspects of materials research, for instance, could be of value to the ITER effort. In researching defect production in steels, there are significant parallels in comparing the damage rate caused by neutrons from fusion reactors to that that caused by neutrons from next generation fission reactors. Investigations using new spallation sources and the planned International Fusion Materials Irradiation Facility could uncover synergies in these two fields. Taking an even broader view, we should remember that, as with any investment in basic research, the benefits of going forward with the ITER project may spread well beyond the field of fusion research. Consider one example. The vast amount of data produced by ITER and its satellite experiments will require advanced vehicles for exchanging this information. Partners worldwide will demand the best possible access to data and information - and the IAEA will make every effort to support such requests. Fusion grids have already been established, but more needs to be done. An analogy might be drawn from the Large Hadron Collider at CERN, which is projected to produce about one percent of the world's internet data when it starts. I would expect similar data volumes to be produced from fusion research operating steady state devices. The drive to advance information technology accordingly will, therefore, probably be one important side benefit from the ITER project. Just as previous large-scale scientific undertakings - such as the space program - have indirectly led to other and unexpected benefits for humanity, it is easy to envision ITER bringing about progress in ways we cannot yet anticipate. Eighteen years ago, the Agency published the first ITER newsletter (See link). In light of recent developments, the newsletter has likely outgrown its initial mandate. The newsletter readership will change and increase, but the objectives will remain the same as those stated in the very first issue, published in September 1988: the dissemination of broad information and understanding - both about ITER itself and about other activities that materially affect ITER - and the coverage of personal and institutional involvements in this international cooperative effort. I extend my best wishes to newsletter readers and the editors serving them, as the story of fusion research moves into this exciting new phase. ITER is truly becoming the incarnation of its Latin meaning: "The Way".